I’m so excited to be sharing this hand crochet pouf pattern with you guys! The minute I made this lovely hand crochet blanket last spring, I knew I would have so much fun trying different projects with this technique. So, it was serendipity when Vickie Howell, guest editor of this special issue of Crochetscene, contacted me to design a hand crochet pouf. This pouf pattern is available digitally in the magazine HERE and hit newstands at your local yarn or craft store on November 8th. 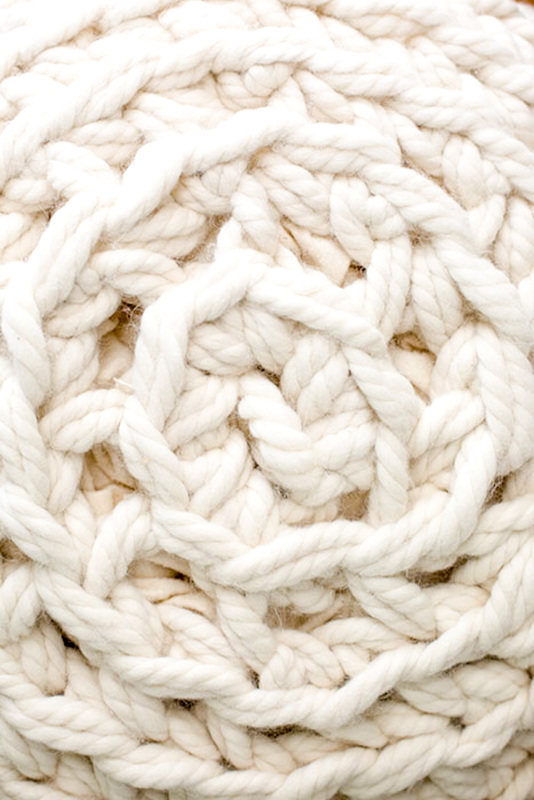 Work this crochet pouf pattern in the round with two strands of Cascade Mondo held together. First, this twisted jumbo yarn is super soft and has great loft. Second, the Mondo is about twice as big as a super bulky yarn, so it adds wonderful bulk. If you would prefer to use a super bulky yarn, follow the same crochet pouf pattern with 4 strands. Hand crochet’s fabric structure holds up better than arm knitting. Not to mention, it is super fun and easy to do. With hand crochet, you only have one stitch on your arm/hand at a time. I know this is a big relief for some! Another benefit of hand crochet is that the pouf is super easy and fast! You can make one for each of your kids in one weekend! At the end, stuff the pouf with an inexpensive full size comforter in the color of your yarn. Or, for cream yarn, natural cotton batting works wonderfully. 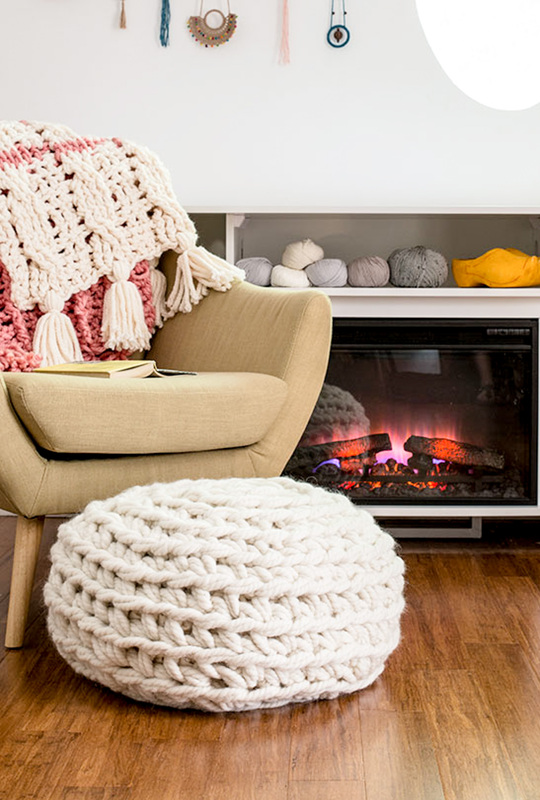 Go check out this issue of Crochetscene – it has amazing decor projects, and just look at the amazing necklaces above the pouf!! Finally, the magazine includes a step-by-step How to Crochet section in addition to some hand crochet how-to. If you’ve never tried it, now is a great time to start. 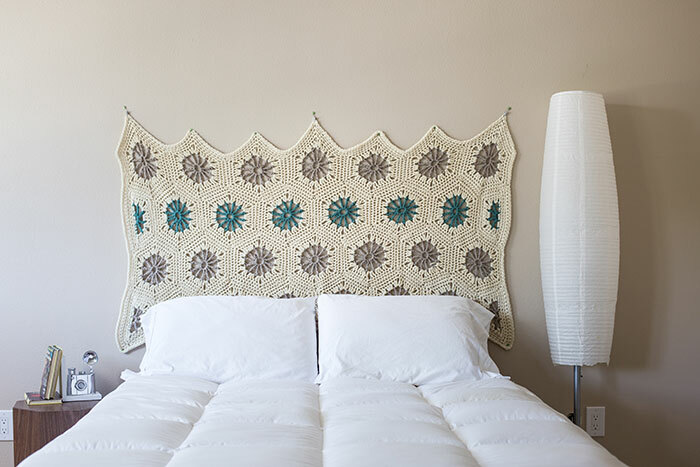 Of course, the magazine is chock full of adorable projects, like this incredible crochet headboard below. Also find beautiful baskets, chunky hats and adorable jewelry. I really want this headboard!! Your comment totally made my day. I’m so glad they all loved what you were doing. Yahooooo! Thanks for sharing your talent with them!! Hi Jessica! I’m so glad you like the pattern. It’s super fun to do!! Is there a pattern (and yarn sources) for the blanket shown in the chair? Hi Melissa, yes! The pattern for that blanket is in this issue of Crochetscene: http://www.interweavestore.com/crochetscene-2017-digital-edition All the information for how to make it and the yarn sources are in that magazine. Happy making! Thanks for writing Maryam. I’m sorry you can’t get the magazine. I’ll be publishing this pattern myself in the next month. Can you wait until then? Did you ever publish the pattern? I would love to have access to the pattern without the whole magazine? I have not yet! But it is on my list! SOON! I just got new yarn I’m going to do it with so the pattern will be updated!